With her dad playing bass and her NYPD sweetie Tad Honeywell playing footsie, Mali Anderson’s dreamy jazz cruise on the QEII would have been perfect except for two hitches: the presence aboard ship of mantrap Chrissie Morgan, hungry for Tad’s attention and not fussy about how to get it, and the news on returning that Starr Hendrix, aspiring vocalist daughter of Jeffrey Anderson’s pianist, has been murdered. Swearing vengeance on the man he says is responsible—Henry Stovall, a.k.a. Short Change, Starr’s heroin supplier and would-be pimp—Ozzie Hendrix takes to the streets of Harlem, and in no time at all Short Change is history. Amazingly, the cops arrest Chrissie’s husband Travis, a computer dealer whose gun was used to settle Short Change’s account, instead of Ozzie, and obviously plan to tie Travis to Starr’s throat-cutting as well. 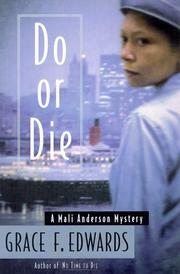 But Mali, the ex-cop whose part-time social-work duties at Harlem Hospital leave her plenty of time for freelance snooping (No Time to Die, 1999, etc. ), is convinced there’s more to the case, and she takes to the streets in turn, armed not with a handgun but with a million questions—to her beautician, the man who sells ices, a retired numbers racketeer, and Short Change’s stable of five other fillies, one for each day of the week. As in her first three cases, Mali’s name-brand dreams of the African-American good life are layered incongruously with the secrets of a down-and-dirty neighborhood that seem worlds removed from the righteous sleuth.